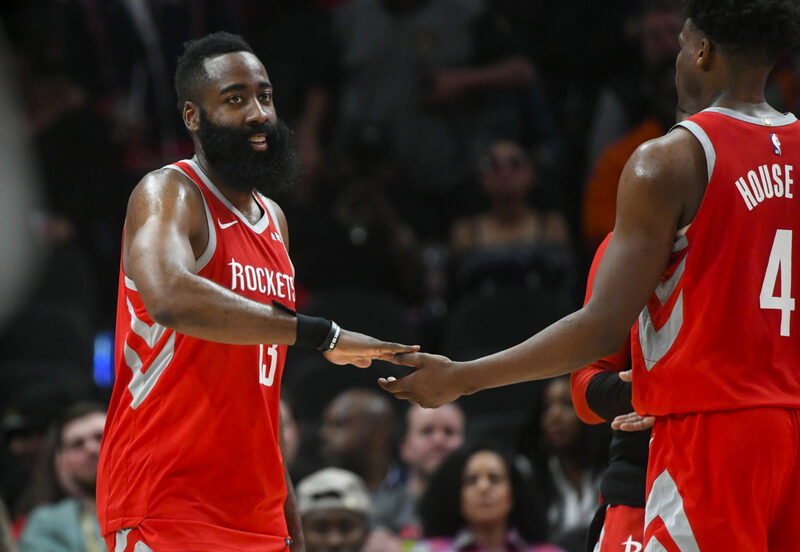 ATLANTA — James Harden had 31 points and 10 assists, Clint Capela added 26 points and 11 rebounds and the Houston Rockets won their third straight game with a 121-105 victory over the Atlanta Hawks on Tuesday night. It was a lopsided matchup. The Hawks, led by Trae Young’s 21 points and 12 assists and John Collins’ 20 points 10 rebounds, are rebuilding and likely headed for the NBA draft lottery. Houston is third in the Western Conference and has plenty of star power. Harden, the league’s scoring leader, is trying to become the first player since Michael Jordan in 1988-89 to average at least 30 points, seven assists, six rebounds and two steals. Atlanta had no player able to defend him for very long. Chris Paul, who last month joined Oscar Robertson, Magic Johnson, John Stockton and Jason Kidd as the only players with at least 17,000 career points, 9,000 assists and 4,000 rebounds, had 13 points, 11 assists, three steals and just one turnover. Atlanta took a two-point lead early in the third on Dewayne Dedmon’s 3, but it lasted just a few seconds. P.J. Tucker, Paul and Harden each followed with a 3 to make it 68-61. The Hawks called timeout before Harden and Tucker each hit a 3 to push the lead back to double digits. Harden fed Capela for a dunk that made it 78-67, and Atlanta coach Lloyd Pierce asked for another timeout. It did little to slow Houston, which went up 104-84 on Paul’s 3. Capela’s three-point play in the second quarter made it 53-42 for the game’s first double-digit lead on an 11-1 Houston run. Rockets: Danuel House Jr. had six 3s and 19 points. … Houston finished with 19 3s, two nights after getting 21 against the Timberwolves. .. Coach Mike D’Antoni continued his pattern of resting players. C Nene sat out Tuesday and will do so on Wednesday. G Iman Shumpert was given Tuesday off. … Harden has at least 10 assists in his last five games. Hawks: Rookie G Kevin Huerter went 2 for 9 from the field and finished with four points in 27 minutes. … 41-year-old Vince Carter, a reserve, had 14 points and nine rebounds in 27 minutes.